Below you will find a list of all the PlayOJO bonuses - offered to new players. The right side offers a casino overview (click to scroll through the images). PlayOJO Casino is a vibrant and colorful expression of fun and entertainment. Established in 2014, it offers an abundance of thrilling online casino games from some of the best in the business. This includes the likes of Extreme Live Gaming, NetEnt, Microgaming and NextGen to name a few. 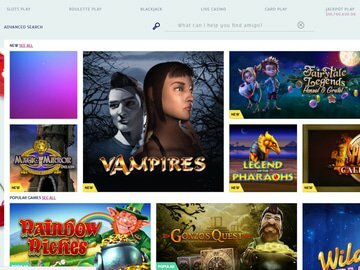 Licensed in Malta, it offers instant play web-browser based gaming in English, Swedish and Finnish. With more than 500 games available, those looking for casino action will be met with a wonderful range of classic and video slots, jackpot slots, card games, roulette, blackjack and live dealer games. Whatever your fancy, this is one casino that wants to tackle it. PlayOJO Casino has an opening offer that is rather unique in its presentation. While most casinos will offer a deposit bonus, this casino offered up to 50 free spins and based that on the amount you deposit. The minimum deposit is $10, and the maximum number of free spins that can be earned is 50 and does not require the use of a bonus code. All winnings that result from the free spins are wager free, and this has great value, as should you win big, winnings can be instantly withdrawn. Club OJO is the casino's loyalty club. The more you play, the faster you will achieve level increases. The casinos has implemented a vibrant VIP program for what is calls its "A-listers" and provides a dedicated VIP manager, free spin and a special gift on special occasions such as a birthday. PlayOJO Casino has many levels to it that will keep you feeling energized with anticipation. This is in part thanks to the large number of game suppliers such as Amaya Gaming, edict egaming, Blueprint Gaming, Microgaming, NextGen Gaming, NetEnt, NYX Gaming, SkillOnNet, SG Gaming, and Williams Interactive. Extreme Live Gaming and Evolution Gaming are the ones that power its live dealer games, with those on offer including all the popular variants of table games such as Blackjack, Baccarat and Roulette, and multiple others. Completing its offered games will find players enjoying blackjack, roulette, card games, and a 17 different jackpot progressive games, many of those being powered by legends such as NetEnt and Microgaming. PlayOJO has in place a substantial number of different payment methods in order to facilitate deposits and process withdrawals. This includes multiple e-wallets such as ecoPayz, Neteller, Paysafecard, PayPal, Skrill, WebMoney, Citadel instant banking, bank wire, eKonto, ePRO, Euteller, entercash, Sofortuberweisung, TrustPay, Trustly, and Zimpler. Maestro, MasterCard, and Visa complete the available options. As for currencies, the options are impressive with most common currencies offered. This includes Candian/Australian and US dollars, Euros, Danish, Norwegian and Swedish Kroner, Francs, UK pounds and S.A Rands. While all deposits, unless processed via bank wire are instant. However, withdrawals are processed based on the method chosen to receive winnings. E-wallets withdrawals are received inside of 24 hours, credit cards take up to 7 days to reflect on your statement, and the same applies to bank transfers. The maximum per transaction withdrawal is $10,000. Those in need of support will be pleased to discover an extensive FAQ section that details answers to many common questions, but also further offers information towards withdrawals, its promotions, responsible gaming and technical support. Should you need to contact the support team, live chat, email, and telephone options are provided. 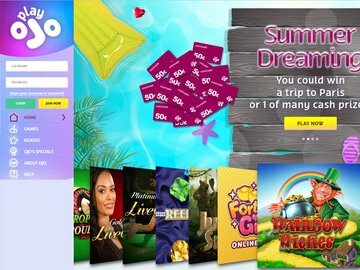 PlayOJO Casino is a solid choice for those looking for a viable online casino experience with a right mix of gaming options. The added live dealer casino further cements PlayOJO's place among top casino contenders, and its large list of deposit/withdrawal options as well as its friendly customer service all come together quite nicely.